Powerful and intensely melodic at the same time, with bruising guitar lines and echoing vocal harmonies that recall the best of Nirvana or Smashing Pumpkins, compared to a range of heavy rockin' acts from Jane's Addiction to The Doors, Quicksand to Fugazi. That was For Love Not Lisa in their mid-'90s day in the sun, when they shared stages with everyone from Fugazi to Stone Temple Pilots. Now they're re-emerging for yet another season in the spotlight, in which they may finally transcend to the level of stardom they always deserved. 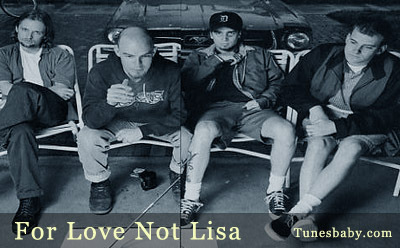 Formed in Oklahoma City in the early '90s, For Love Not Lisa began as a series of jam sessions between guitarists Mike and Miles. The pair quickly picked up bassist Clint and drummer Aaron, packed their bags, and moved to Los Angeles to find fame and fortune. Inspired equally by punk and metal, their 1992 debut EP was acclaimed by critics and fans, and the band hit the big time, signing with Elektra/East West. Their debut album, Merge, was released in 1993, and the group began touring with superstars from Green Day to Candlebox , Stone Temple Pilots to Rage Against the Machine (not to mention shows with The Bay City Rollers and The Tubes!). After touring behind the Merge record F.L.N.L. was asked to contribute the song 'Slip Slide Melting' to the motion picture THE CROW (staring Brandon Lee). With the soundtrack going on to sell over two million records, interest in the band increased, so with Slip Slide Melting in heavy rotation at hard rock radio and a few spins at MTV the band went into the studio to record the songs which would become their second full length record - 'Information Superdriveway. Unfortunately, the pressure, as well as, the letdown of not being able to capitialize on the attention The Crow brought upon the band helped fuel the fire of frustration that was slowly breaking the band apart. But the good folks at Tooth & Nail have convinced them all that the time has come again For Love and for Lisa, and they're back again with Lost Elephant, a medley of new, old, and rare from a band that has the true energy of rock'n'roll emblazoned in its music in a way that few bands still do. Unreleased b-sides are supplemented by an assortment of rarities from their previous incarnation, including the group's first demo recorded in a basement in OKC City (1991) along with tracks from the long-unavailable 1992 Elephant EP.